Editor’s note: This is the first in a four-part series examining genetic engineering’s impact on our lives. The second installment examines regulatory obstacles blunting the potential of genetically engineered animals; the third looks at the role of gene editing in medicine; and the final segment looks at synthetic biology and other novel applications. Humankind is on the verge of a genetic revolution that holds great promise and potential. It will change the ways food is grown, medicine is produced, animals are altered and will give rise to new ways of producing plastics, biofuels and chemicals. Many object to the genetic revolution, insisting we should not be ‘playing God’ by tinkering with the building blocks of life; we should leave the genie in the bottle. This is the view held by many opponents of GMO foods. But few transformative scientific advances are widely embraced at first. Once a discovery has been made and its impact widely felt it is impossible to stop despite the pleas of doubters and critics concerned about potential unintended consequences. Otherwise, science would not have experienced great leaps throughout history­­—and we would still be living a primitive existence. Within the next few years, this new biotechnology will give us higher-yielding crops, healthier livestock, and more nutritious foods. Within a few decades, we might well have genetically engineered pigs that can serve as human organ donors…we are on the cusp of a new era in the history of life on earth—an age in which humans exercise an unprecedented level of control over the genetic composition of the species that co-inhabit our planet. It won’t be long before CRISPR allows us to bend nature to our will in the way that humans have dreamed of since prehistory. The four articles in this series will examine the dramatic changes that gene editing and other forms of genetic engineering will usher in. Despite the best efforts of opponents, GE crops have become so embedded and pervasive in the food systems—even in Europe which has bans in place on growing GMOs in most countries—that it is impossible to dislodge them without doing serious damage to the agricultural sector and boosting food costs for consumers. Even countries which ban the growing of GMOs or who have such strict labeling laws that few foods with GE ingredients are sold in supermarkets are huge consumers of GE products. Europe is one of the largest importers of GMO feed in the world. 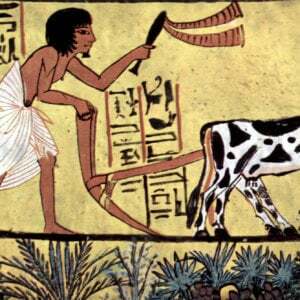 Most of the meat we consume from cattle, sheep, goats, chickens, turkeys, pigs and fish farms are fed genetically modified corn, soybeans and alfalfa. 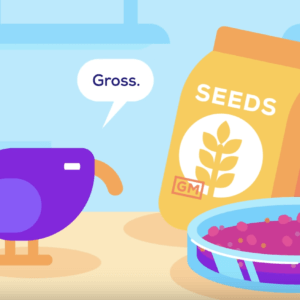 And the overwhelming majority of cheeses are made with an enzyme produced by GM microbes and some beers and wines are made with genetically engineered yeast. North America, much of South America and Australia are major consumers of foods grown from GE seeds. Much of the corn oil, cotton seed oil, soybean oil and canola oil used for frying and cooking, and in salad dressings and mayonnaise is genetically modified. GM soybeans are used to make tofu, miso, soybean meal, soy ice cream, soy flour and soy milk. GM corn is processed into corn starch and corn syrup and is used to make whiskey. Much of our sugar is derived from GM sugar beets and GE sugarcane is on the horizon. Over 90 percent of the papaya grown in Hawaii has been genetically modified to make it resistant to the ringspot virus. Some of the squash eaten in the US is made from GM disease-resistant seeds and developing countries are field testing GM disease-resistant cassava. Many critics of GE in agriculture focus on the fact that by volume most crops are used in commodity food manufacturing, specifically corn and soybeans. One reason for that is the high cost of getting new traits approved. Indeed, research continues on commodity crops, although many of the scientists work for academia and independent research institutes. For example, in November 2016, researchers in the UK were granted the authority to begin trials of a genetically engineered wheat that has the potential to increase yields by 40 percent. The wheat, altered to produce a higher level of an enzyme critical for turning sunlight and carbon dioxide into plant fuel, was developed in part by Christine Raines, the Head of the School of Biological Sciences at the University of Essex. A new generation of foods are now on the horizon, some as the result of new breeding techniques (NBTs), such as gene editing. Many of these foods will be nutritionally fortified, which will be critical to boosting the health of many of the poorest people in developing nations and increase yields. 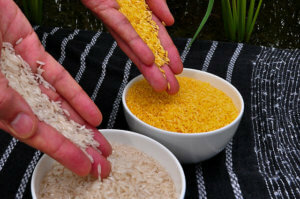 Golden rice is a prime example of such a nutrition-enhanced crop. It is genetically engineered to have high levels of beta carotene, a precursor of Vitamin A. This is particularly important as many people in developing countries suffer from Vitamin A deficiency which leads to blindness and even death. Bangladesh is expected to begin cultivation of golden rice in 2018. The Philippines may also be close to growing it. 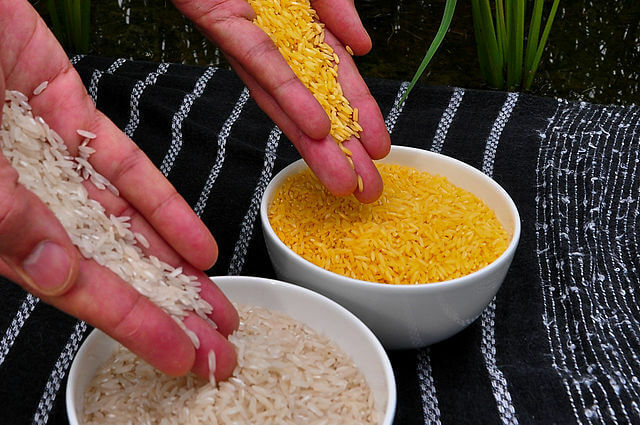 A strain of golden rice that includes not only high levels of beta carotene but also high levels of zinc and iron could be commercialized within 5 years. “Our results demonstrate that it is possible to combine several essential micronutrients – iron, zinc and beta carotene – in a single rice plant for healthy nutrition,” said Navreet Bhullar, senior scientist at ETH Zurich, which developed the rice. The Science in the News group at Harvard University discussed some of the next generation foods. Looking beyond Golden Rice, there are a large number of biofortified staple crops in development. Many of these crops are designed to supply other micronutrients, notably vitamin E in corn, canola and soybeans…Protein content is also a key focus; protein-energy malnutrition affects 25% of children because many staple crops have low levels of essential amino acids. Essential amino acids are building blocks of proteins and must be taken in through the diet or supplements. So far, corn, canola, and soybeans have been engineered to contain higher amounts of the essential amino acid lysine. Crops like corn, potatoes and sugar beets have also been modified to contain more dietary fiber, a component with multiple positive health benefits. Other vitamin-enhanced crops have been developed though they have yet to be commercialized. 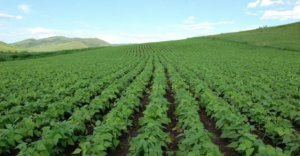 Australian scientists created a GE Vitamin A enriched banana, scientists in Kenya developed GE Vitamin A enhanced sorghum and plant scientists in Switzerland developed a GE Vitamin B6 enhanced cassava plant. None is near approval, however. Scientists genetically engineered canola, a type of rapeseed, to produce additional omega-3 fatty acids. Research is being conducted on developing GM gluten free wheat and vegetables with higher levels of Vitamin E to fight heart disease. FDA has approved the commercialization of a GE non-browning apple—the Arctic Apple, developed by using a gene-silencing technique. Simplot has developed GE potatoes created using gene-silencing techniques. They are less prone to bruising and blackening, in some cases are resistant to certain diseases and also contain less asparagine which reduces the potential for acrylamide that is created when frying, baking and roasting. Other products are in development that fight viruses and disease. Scientists have used genetic engineering to develop disease-resistant rice. A new plum variety resists the plum pox virus. It has not yet been commercialized. 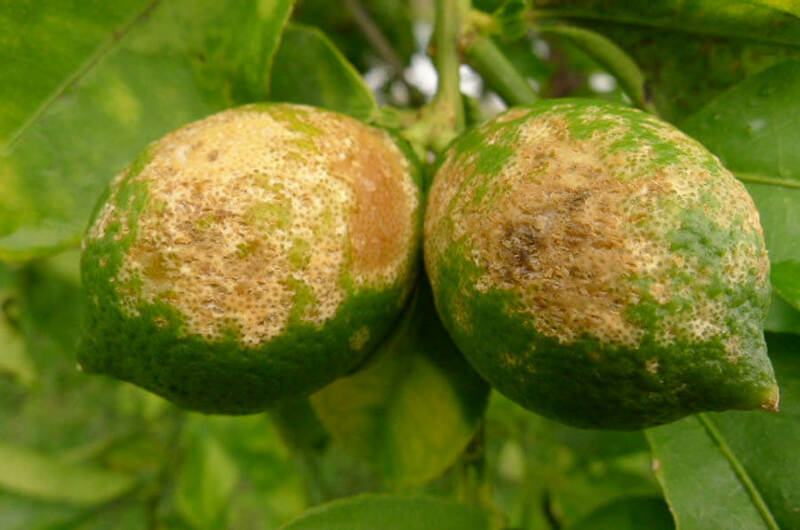 GE solutions may be the only answer to save the orange industry from citrus greening, which is devastating orange groves in Florida. GE might be utilized to curb the damage caused by stem rust fungus in wheat and diseases effecting the coffee crop. In Africa, GE solutions could be used to combat the ravages of banana wilt and cassava brown streak disease and diseases that impact cocoa trees and potatoes. 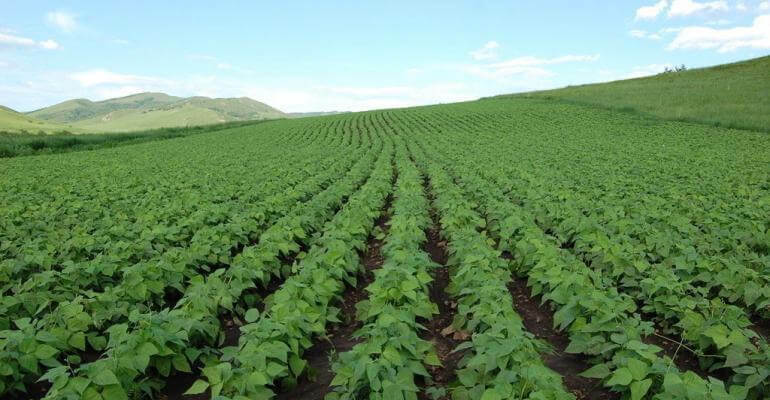 A GE bean has been developed in Brazil that is resistant to the golden mosaic virus. Researchers at the University of Florida, the University of California-Berkeley and the 2Blades Foundation have developed a disease resistant GM tomato. Scientists at the John Innes Center in the UK are attempting to create a strain of barley capable of making its own ammonium fertilizer from nitrogen in the soil. 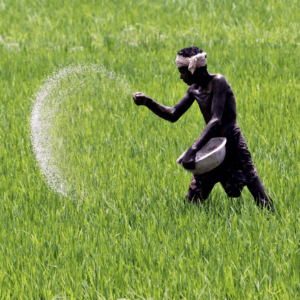 This would be particularly beneficial to farmers who grow crops in poor soil conditions or who lack the financial resources to buy artificial fertilizers. Peggy Ozias-Akins, a horticulture expert at the University of Georgia has developed and tested genetically-engineered peanuts that do not produce two proteins linked to intense allergens. New gene editing techniques (NBTs) such as CRISPR offer great potential and face lower approval hurdles, at least for now. Scientists at Penn State have removed the gene that causes white button mushrooms to discolor, and the product was quickly approved. In 2014, scientists in China produced bread wheat resistant to powdery mildew. Calyxt, a biotechnology company, has developed a potato variety that prevents the accumulation of certain sugars, reducing the bitter taste associated with storage. The potato also has a lower amount of acrylamide. 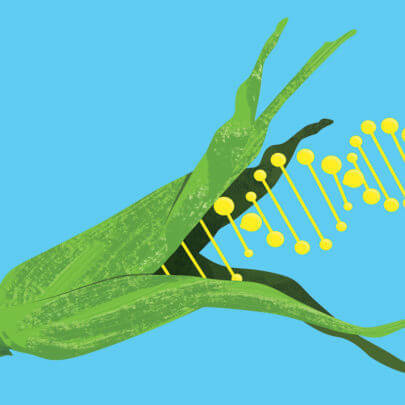 DuPont has developed a gene-edited variety of corn, which can be used to thicken food products and make adhesives. In June, the EPA approved a new first of its kind GE corn known as SmartStaxPro, in which the plant’s genes are tweaked without transgenics to produce a natural toxin designed to kill western corn rootworm larvae. It also produces a piece of RNA that shuts down a specific gene in the larvae, thereby killing them. The new GE corn is expected to be commercialized by the end of the decade. The consequences of simply sustaining the chaotic status quo—in which GMOs and other innovative plant products are summarily demonized by activists and the organic lobby—are frightening when one considers mounting challenges to food production, balanced nutrition and poverty alleviation across the world. Those who seek to fuel the GMO versus the non-GMO debate are perpetuating irresolvable difference of opinion. 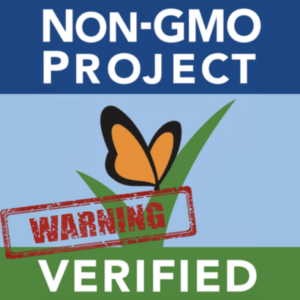 …Those who seek to perpetuate the GMO controversy and actively prevent use of new technology to crop breeding are not only on the wrong side of the debate, they are on the wrong side of the evidence. If they continue to uphold beliefs against evidence, they will find themselves on the wrong side of history.